The International Dairy Federation (IDF) is the global voice of dairy towards stakeholders and intergovernmental organizations and an NGO observer in Codex. Nico van Belzen is Director General and spoke to Codex about AMR. Codex: Antimicrobial Resistance is not constrained by geographic borders therefore limiting the development of AMR requires the implementation of global strategies. Why is it important today to raise the awareness of all stakeholders involved? van Belzen: The spread of AMR threatens our ability to treat common infectious diseases, resulting in prolonged illness, disability, and death of humans and animals. Incorrect use of antimicrobials is accelerating this process. AMR is not constrained by geographic borders or species. Resistant bacteria arising either in humans, animals, plants or the environment may spread from one to the other, and from one country to another. Limiting the development of AMR requires the implementation of global strategies by public health, veterinary and environmental authorities in all countries of the world. Integrated supply chain management approaches (now adopted by the dairy sector) require positive action and cooperation by all participants. Dairy farmers, veterinarians, dairy and meat processing companies, pharmaceutical companies and regulators all need to be involved to limit the spread of AMR. Codex: Policy-makers play a key role in tackling the emerging public health problem of antimicrobial resistance. What is IDF currently doing to promote responsible and prudent use of antimicrobials? van Belzen: The International Dairy Federation has provided science-based expertise for the global dairy sector since 1903. IDF promotes prudent and responsible use of antimicrobial agents within the global dairy industry to ensure that they continue to be effective for curing diseases in animals while minimizing the risk of developing AMR. IDF published a factsheet Guidance in Antimicrobial Resistance from the Dairy Sector (2017). This document explains the global dairy position on AMR and supports the harmonized implementation of the global strategies on AMR. This factsheet complements the already existing IDF Guide to Prudent Use of Antimicrobials Agents in Dairy Production (2013),the IDF factsheet on control and detection of antimicrobial residues in milk and dairy products (2014), the IDF factsheet on Antimicrobial Resistance (2012). IDF encourages good animal health and welfare because it is also crucial to limit disease in animals, improve animal welfare and minimize the need for antimicrobial use. Early detection of disease allows early intervention and this minimises the need to use antimicrobials. Improved infection prevention and control measures limit disease spread and progressively reduce the usage of antimicrobial agents. 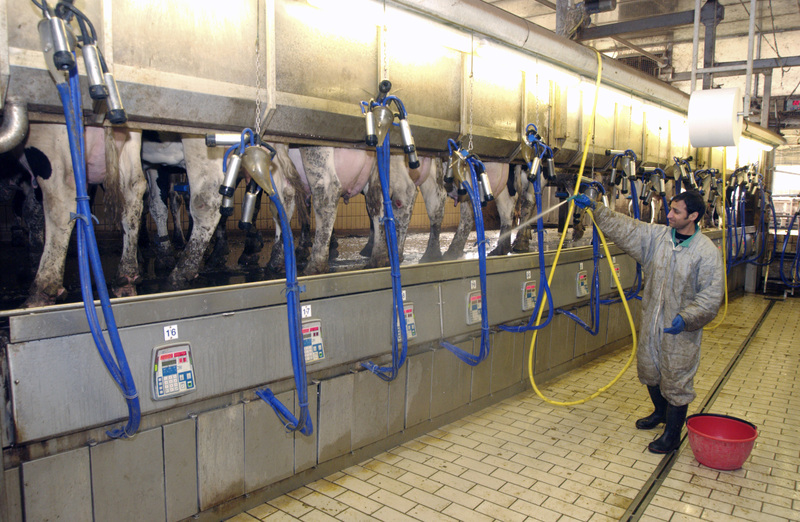 To support best practices at the farm, the FAO/IDF Guide to Good Dairy Farming Practice (2011), encourages best farming practices for the production and marketing of safe, quality-assured milk and dairy products. The IDF created a Task Force (TF) on antimicrobial resistance (AMR) to support the development of National Action Plans for adequate AMR management for the dairy sector and its alignment with the Global Action Plan. This TF is currently monitoring the activities resulting from the National Action Plans of IDF member countries in order to report back on the efforts of the dairy sector. IDF actively participates in the Codex Alimentarius TF on AMR’s revision of the Code of Practice to Minimize and Contain AMR and drafting Guidelines for the integrated monitoring and surveillance of foodborne AMR. Codex: Prevention and control of the development and spread of antimicrobial resistance in the food chain is a significant part of Codex work. As Codex Observer, why do you think the world needs food safety standards that address AMR? van Belzen: Guidance on AMR from international organisations such as Codex, OIE, FAO and WHO is necessary to increase awareness and promote a globally harmonized approach for the prevention and surveillance of AMR. IDF participates in the Codex work on AMR and also in Codex work on food hygiene, veterinary drugs, and many other topics. Codex food safety standards are expected to be implemented at the national level. The whole supply chain approach is required to manage the food safety risks associated with modern food production.